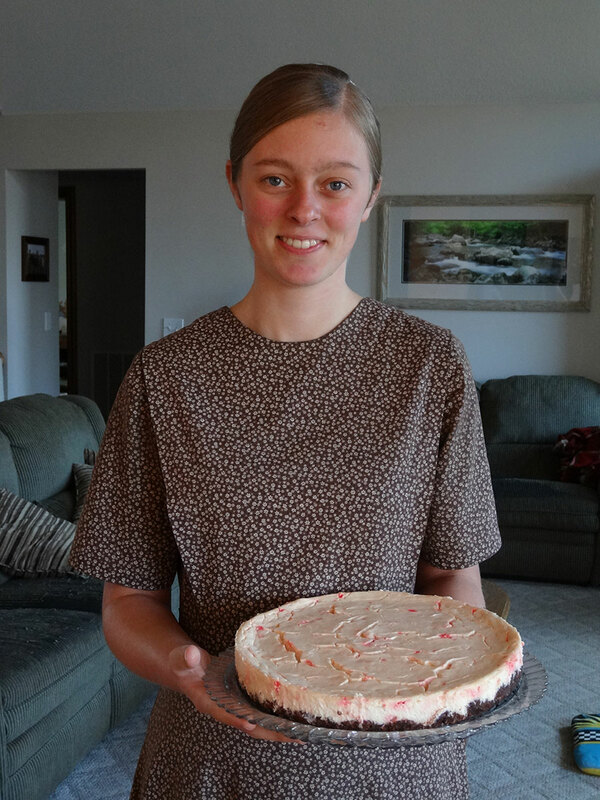 I’ve had an idea cooking (er…baking) in my head for awhile now, and it was inspired by an old Southern Living Christmas recipe for Layered Peppermint Cheesecake. The original recipe is a layer cake that uses both a sour cream white cake and peppermint cheesecake layers. I never got around to trying it, but with my birthday coming up, I decided to tweak it THM style. 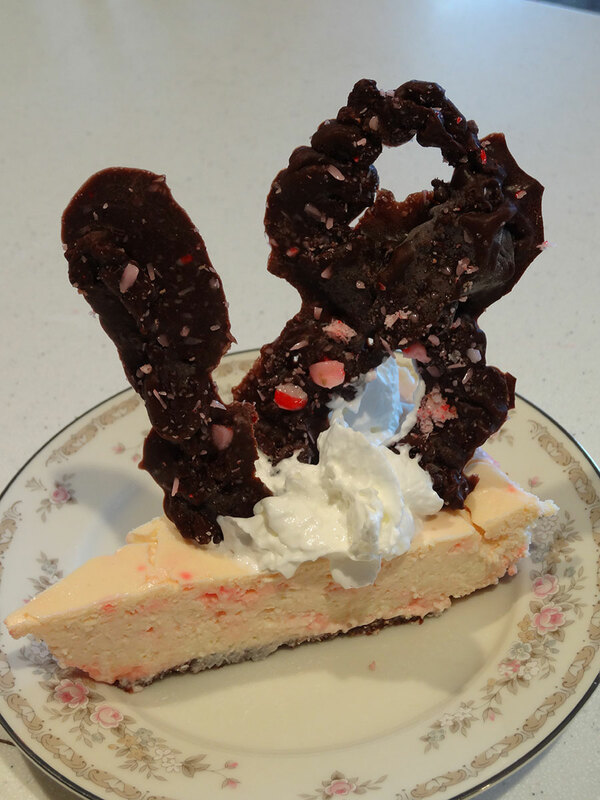 I could easily forgo the cake layers, but the peppermint cheesecake looked salvageable. Add a brownie crust and you have a winner! All in all, it was a pretty good finale to my birthday meal, which consisted of grilled chicken, cabbage sautéed in butter, and spinach salad. Click here to see a more recent recipe for Peppermint Cheesecake Bars! You can find this recipe (with an updated picture) in my cookbook, Necessary Food. For the crust: melt the butter, water, peanut butter, and cream cheese together in a nonstick saucepan until smooth. Take off the heat and add the dry ingredients and egg. Beat until smooth and spread into the bottom of a greased 10" springform pan. Bake at 350 degrees F for 5 minutes. For the cheesecake: beat the cream cheese until smooth. Add the eggs one at a time, beating between additions. Add the rest of the ingredients except for the crushed peppermints and mix. Fold in the peppermints. Pour the cheesecake mixture onto the prebaked crust. Water bath: place the springform pan (filled with cheesecake batter) in the center of a piece of wide tinfoil and press the tinfoil up around the sides of the pan so water can't get in. Place the tinfoil-wrapped pan into a larger pan (such as a circular pizza pan with sides on it), then fill the large pan with a half inch of water. Place this whole contraption in the oven. Gluten free oat fiber can be purchased from the Trim Healthy Mama online store. Any ideas on how I could make this in a cupcake pan for individual servings? Would it be ok to use liners? Sure, you can use liners! I’ve never tried it as mini cupcakes so it’ll be an experiment! You may want to make only a partial batch since you would need quite a few cupcake tins to use the batter for an entire cheesecake. 🙂 Keep in mind that in smaller quantities the baking times will probably be lower all around.